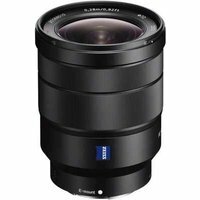 The Sony FE16-35mm f4 ZA OSS T* lens with E-mount is a wide-angle zoom for 35mm full frame format compact system cameras. Compact and lightweight, the lens features Optical SteadyShot image stabilisation and a constant f4 maximum aperture throughout the zoom range to deliver exceptional performance in a variety of conditions. Compatible with both full-frame and APS-C Sony E-mount cameras.